The A18 Acrylic Patio Side Table is a must-have around any pool! This patio side table features an acrylic tabletop with a hammered finish and 1 inch round, extruded aluminum tubing. 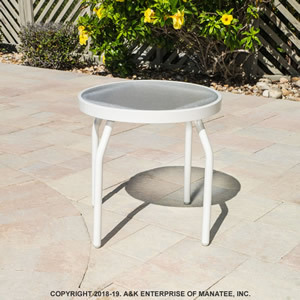 The A18 Acrylic Patio Side Table may be powder-coated in any of the frame finishes.